A fictional world would collapse if not for the networks of people and creatures who hold it up. As a writer, it becomes your imperative to shape the ways in which characters participate in dynamic interactions with one another, as well as the ways in which their stories influence and are influenced by the motives of other characters. 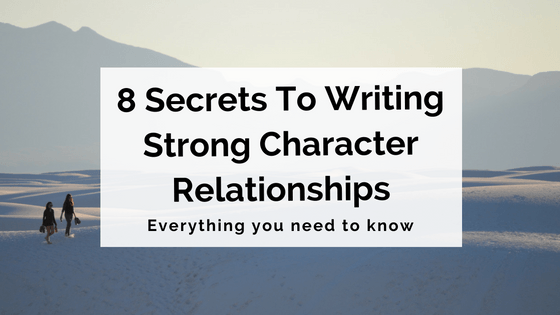 Use these 8 secrets to craft stronger characters, with more authentic relationships. Whether it's about physical appearance or personality, describe your character in relation to your other characters. This technique is particularly useful when writing in first person or third person limited. For example, rather than saying that Anna is five foot tall or that she is short, say that she only reaches to the protagonist's shoulder despite wearing high heels, or that the protagonist has to tilt his head downwards in order to meet her eyes. In this way, you more vividly conjure an image of your character within the reader's mind. In other words, you're leveraging the 'show, don't tell' mantra. It's far more effective to use actions rather than abstract measurements (like "five feet") or ambiguous terms (like "short") to animate description. Author Moira Allen notes that setting is brought to life, most often through the character's actions, mood, experience and sensory experiences. Setting has the capacity to build the reader's expectations of one character's relationship to another. For instance, let's use the setting of a thunderstorm. If you write about the dark clouds swallowing up any sign of light and the rain battering away every last drop of warmth that the characters have left between them, you evoke within the reader a sense of foreboding that indicates only to the doomed relationship that these two characters share. If you use that same setting of the thunderstorm but instead choose to write about the way they laughed and danced in the rain and leapt into each other's arms every time the sky roared its majestic symphony, you end up generating an entirely different mood. One filled with hope and love, one that shows the reader the endurance of their friendship and their genuine trust in one another. Rather than saying that "the wind blew", tell your readers how it "blew". Pathetic fallacy comes to play here. Did the wind moan? Did it rattle the windows like a prisoner in rage? Perhaps you may decide to simply infer the presence of the wind by describing the way the waves restlessly battered against the shore or the way the trees shook their heads in violent fury. By employing these kinds of evocative phrases, you open up a portal of emotion through which the reader can discern whether it is turbulence or solidarity that exists between the characters. Authentic dialogue can divulge a wealth of information about the character's personality and feelings towards another character. As Stephen King so rightly says, it's a way of "bring[ing] characters to life through their speech". More than that, it is a way of bringing the malleable relationships between these characters to life. Readers want authentic dialogue, but this dialogue should always play a role in developing plot, characters or character relationships. Aim to write dialogue that is purposeful. Think of dialogue that incorporate actions (whether it be a lingering glance or a re-adjusting of the collar) or dialogue that intrigues the reader and prompts questions. Is it a secret love that he hides behind his cold and cutting words, or does he truly loathe her? Is his dialogue genuine or deceiving? What could the contrast between the overconfident way he speaks and the way he teases the hems of his shirt underneath the table mean? More interestingly, how does the way he speaks vary depending on whom he is speaking to? Is he more open to some characters than others? And finally, what could all of this mean? This is where internal monologues become useful. What cannot be said in the dialogue that you do want to reveal about your character goes here. Think of this internal monologues as a way of letting the reader take a glimpse behind the curtains of the main stage. What are your characters thinking that they aren't elucidating in their speech? In some respects, internal monologues can become the reader's most intimate connection to a particular character. Granting the reader the power to enter a character's thoughts means giving them access to your character's rawest, most vulnerable states of mind. It means allowing them to gain insight into your character's true opinions of other characters. Don't shy away from this opportunity. Rather, take advantage of it. Use internal monologues as a method to reveal to the reader the biases and blind spots that drives a particular character and that in turn influences their relationships with those around them. "They have history". Three words that explain the air of distance and awkwardness lingering between two individuals. It's important to remember that your characters have a history that often transcends the boundaries of the story at hand. Ask yourself, how do your characters' pasts intertwine with one another? Think of Romeo and Juliet. While Romeo and Juliet did not share any kind of history prior to their first meeting, their respective families did. It was because of the enduring feud between the Montagues and Capulets that complications subsequently arose for the two young lovers. This example demonstrates not only how your characters' backstories may play into each other (whether directly or indirectly), but also how this may in turn shape plot as well as the outcome of the story. Why is your antagonist so closed off? Why does he detest the protagonist so much? Why is he so eager to see his hometown spiral into a state of despair and tyranny? Then, once the questions are out there floating in the minds of the reader, gradually interweave some backstory into your tale. Relevant backstory is a finite resource, so you need to give readers just enough to keep their interest going. This is why mysterious villains’ origins are usually revealed towards the end of a novel. The writer waits until the last minute to use up this resource, teasing just enough along the way to keep the reader engaged." Character motivation directly stems from character backstory. Just as how you would explore the ways in which different characters' backstories clash, so too should you delve into their disparate motivations and examine the potential external conflicts that may arise. Ask yourself, how do the drives and standpoints of each character differ? If a group of people in your story are working together but end up having vastly conflicting final goals, how will this damage their ability to cooperate? As with backstories, you must constantly ask 'why'. In editor Suzannah Windsor words, find out "Why do people act a certain way? Talk a certain way? Believe certain things?" Discover what motivates your characters, then examine the ways in which those motivations support or undermine each other. Character evolution is at the heart of any good story. Whether it’s the protagonist doing the changing, or whether he’s changing the world around him, character arcs are ultimately the whole point of fiction. The change–the journey from one spiritual/emotional/intellectual place to another–is the story of humanity." Character arcs form a vital part of character-building. After all, readers want to have vicariously learnt something or gained some form of wisdom by the conclusion of the protagonist's journey. Moreover, examine not only how each character progresses through their journey, but also how those journeys intertwine with one another. Consider how changes in one character's mindset impacts their interactions with other characters. How do the dynamics between different characters shift over time because of such changes? Perhaps two sworn enemies become friends when they realise that they have more in common than they had been previously led to believe. Perhaps these two friends revert back to being enemies when an act of betrayal breaks their trust in one another and consequently forces them apart. Ask yourself: What lessons do the characters (and the reader) learn from each of those encounters? How do their encounters with other characters shape their own transformations as a person? Minor characters, though less prominent than your major characters, still have a vital role. Among other things, they ensure the integrity of your novel or piece of fiction. The exchanges that occur between them may be slight, subtle and seemingly trivial, yet these small exchanges become necessary nuances in your story. If your story world is a lattice, then the minor characters are the final strips of wood that lock everything into place and ensure the overall structure's cohesion. The purpose of minor characters for the reader is not to know their stories; it's to know that they each have a story, to know that they are as much a part of the story world as your major characters. So let every encounter between your characters be important. Remember that it's when you as the writer understand the significance of character relationships that you are able to most profoundly understand the characters themselves. It's time to get writing and get exploring! A world of meaningful character interactions awaits. To learn more about creating compelling characters, click here. Is it okay if you want to start off the two main characters as an engaged couple? How do you make the engagement period believable?